MULTICULTURAL communities are to be “centre stage” of the Church – not isolated and on the margins – if the future of the Church is to become what Jesus wants. 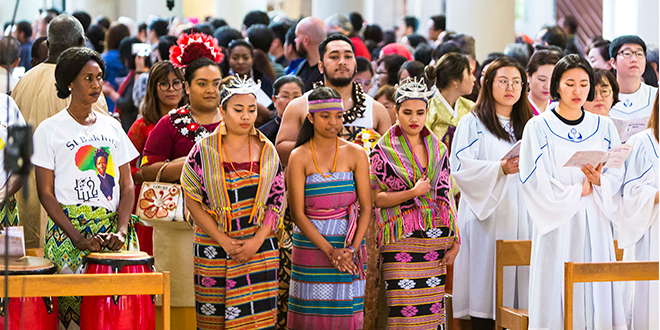 In his homily for Brisbane archdiocese’s annual Multicultural Mass last Sunday, Archbishop Mark Coleridge repeated his desire to see multicultural groups included more in the heart of the Church. Archbishop Coleridge gave his homily to the congregation at St Stephen’s Cathedral, where there were Catholics from numerous countries including Korea, South Sudan, Brazil, China, Samoa, Italy, Iraq, Syria, East Timor, Malta, Sri Lanka, India, Vietnam, Indonesia, Latin America and Fiji, and from the Eastern Catholic Melkite, Maronite, Syriac and Syro-Malabar rites. Chaplains ministering to these cultural communities and priests from the Eastern Catholic rites concelebrated the Mass with Archbishop Coleridge. The Mass commemorated Pope Francis’ message for the 104th World Day of Migrants and Refugees, in which he called the Church to be “welcoming, protecting, promoting and integrating migrants and refugees”. 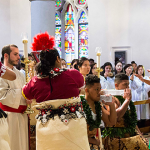 Speaking to the various cultural groups, Archbishop Coleridge said multicultural communities should no longer be treated in Brisbane and beyond “as kind of exotic satellites”. He even said the term “ethnic communities” was “troubling” because “it presumes that there may be some community that is not ethnic”. The dominant group that influenced the Church in Australia until recent times, the Anglo-Celtics, were an ethnic group “that gave people like me birth”. “That is no longer true because what we recognise and celebrate here this afternoon is that much of the real spiritual energy in the Church in this part of the world is found in the communities to which you belong,” he said. The Archbishop said Australia needed all multicultural communities “in this time of profound and often painful change, where the future must be shaped”. “So in the name of Jesus Christ, who has the words of eternal life and to whom we come, I call you now out of the shadows into the light, I call you from the margin into the centre so that together we can enter the culture of God and celebrate as one family with one God who is father of all, over all, and in all,” he said. Click any photo below to view the gallery. Full spread of photos can be seen in The Catholic Leader’s September 2 edition. 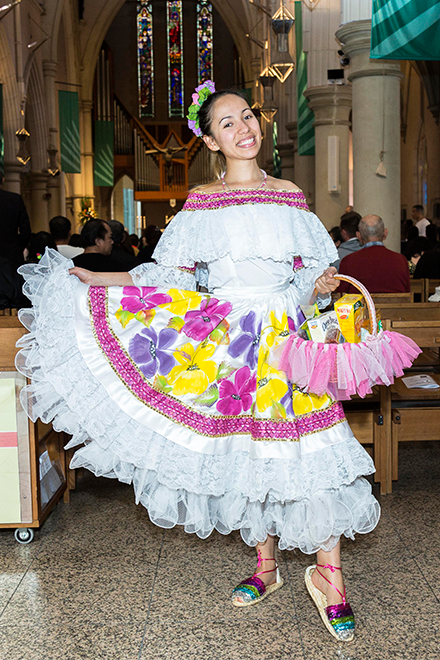 Swirl of colour: Margareth Pena represents the Catholics from Colombia as she prepares for the start of the Mass. Photo: Alan Edgecomb. Good News: Melkite Father Elie Francis prepares to receive the Book of the Gospels as a procession reaches the cathedral sanctuary. Photo: Alan Edgecomb. 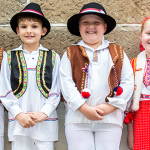 Joy of youth: Dressed in keeping with their Croatian heritage are (from left) Dalibor Medjedovic, Cooper Sarcevic, and Noah and Nadia Mccandless. Photo: Alan Edgecomb.